Interview with Amy Cudden who is currently performing as Rachel Crabbe in One Man, Two Guvnors at the Theatre Royal Haymarket. 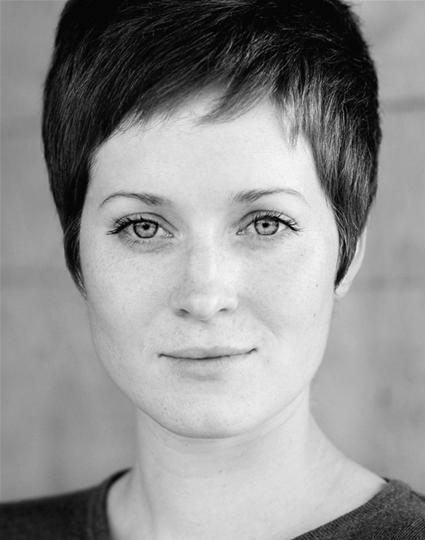 Amy recently took time out from her busy schedule to answer some questions about herself and One Man, Two Guvnors. Enjoy! How did you get inspired to head for a career in the performing arts? My Dad is a great storyteller, and I was a bit of a bookworm when I was little, so I think I just wanted to continue to tell stories that I could get lost in. You performed in several roles before formal training as an actor. Can you tell us about this? I was part of a local theatre school on Saturdays from the age of about 12 and we all took part in a yearly show, usually a musical. My poor mum had to make me a bird costume once for a production of The Lion, the Witch and the Wardrobe. My best friend was part of the company too, so we got together and made bright yellow chicken costumes from yellow dusters with enormous wobbly red combs on our heads. We turned up and everyone else was in silvery blue leotards with wispy wings, looking graceful and elegant. We didn’t exactly blend in. I think it was the highlight of the show for my Dad. I then joined a semi-professional theatre company based at the Maddermarket Theatre in Norwich, and did much more grown-up things like restoration comedies and Berkoff’s Metamorphosis which we also toured around desperately uninterested high schools! What are your likes and dislikes about touring? I’ve never been on a long tour, but my likes about travelling away for a job are getting to know a new place, finding out little places you like to eat at, and nice walks. Dislikes are being away from my husband. The last time I was away for a job we got married three weeks in, that was especially tough. You studied Acting at Bretton Hall, and then Post Graduate Acting at The Oxford School of Drama. What are your favourite recollections from your time then? Bretton Hall was a great school, I had a brilliant time there. In the first year we staged a site-specific walk-around performance in the grounds of the school, which is the West Yorkshire Sculpture Park. There were lots of little groups sprinkled around and the audience ambled through and happened upon all these pockets of performances. The last show on the last night was set in a quarry, and was so beautiful. The fact it was only on for one night made it extra special. There was a great camaraderie between the students there. We didn’t take ourselves too seriously. The Oxford School of Drama was a turning point for me. It’s a fantastic school that invests so much in the individual students. I loved everything about it, but the Summer Term was especially memorable. We staged A Midsummer Night’s Dream open air at Blenheim Palace in an arena made of hay bales. It was hard work and we played quite a few rainy nights, but so much fun. Some actors don’t have formal training but have very successful careers on the stage. What have been the benefits of training for you? 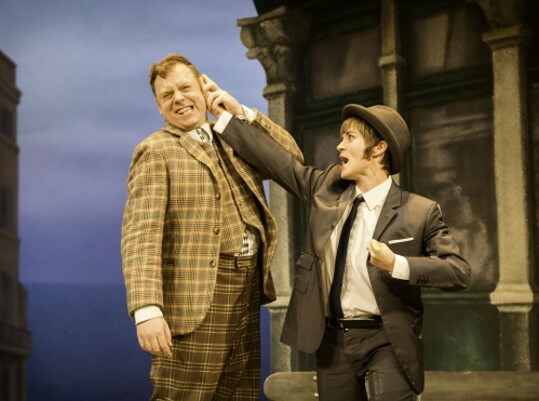 Stamina, especially in a show like One Man Two Guvnors. To repeat a performance night after night over a long run can be exhausting. You have to take care of your voice and your body but also keep coming back to the basics of training, finding a way to be present, going back to your choices and intentions, keeping it alive. It’s been invaluable having a strong training, it supports everything. As well as the stage you have also appeared on television including in Casualty, The Bill and Dr Who. What do you enjoy most about acting for television? How did it feel to be on an internationally popular programme such as Dr Who? I think I prepare in the same way for both TV and Theatre, but the experience of both I find very different. Theatre is immersive and there’s so much to be discovered in a role you can perform again and again. Television is much more immediately demanding on the ability to slip into a character, and be completely present and alive in the situations. I find that really terrifying and exciting, how quickly you have to focus in and be ready to go. When it goes well, it feels like you’ve just walked a high wire. Dr Who was brilliant. I was sat in front of these double navigation screens in the Teselecta, the space ship I was co-pilot of, with lots of wheels and buttons and gadgets on them, it was the most fun ever. I kept fiddling around with the equipment and my headset, I felt like Uhura from Star Trek! Before your current part what was your favourite stage role and why? Can I have two? If not the chicken in ‘The Lion, the Witch and the Wardrobe’, it would have to be Becky in ‘The Village Bike‘. I did a show previously at the Soho, ‘Shallow Slumber’ which would be a definite contender, but the show itself was very intense and a bit of an emotional marathon. ‘The Village Bike‘ is a new play by Penny Skinner, a very provocative and intelligent writer. It’s about gender politics and sexuality, and the character I played in it, Becky, is one of the most complex, funny, dark, and witty characters I’ve read written for a woman. It was a real gift, and I was so lucky to get to play her. Fantastic director and company too, really lucky! You are currently playing the part of Rachel Crabbe in One Man, Two Guvnors. Can you tell us about your character and how she fits into the storyline? Rachel Crabbe spends most of the play disguised as her evil twin brother Roscoe Crabbe in order to collect a dowry owed to him by the father of the girl he was supposed to be getting engaged to – Pauline Clench. The twist is that Roscoe Crabbe has recently been murdered by Rachel’s fiancee Stanley, and together they are the two ‘Guvnors’ in the play that Francis Henshall, the ‘One Man’ is trying to serve without either of them discovering he’s working for two people. This means that Rachel and Stanley spend most of the play just missing each other. Rachel wants to collect the money so that she and Stanley can emigrate to Australia and avoid the police, because despite the fact he killed her twin brother, who was a nasty piece of work by all accounts, she is still very much in love with him. Is there any part of Rachel Crabbe that you have looked to ‘develop’ or add your own style to? I think I was eager to find a way to do man acting without swaggering around the stage like a little boy in his dad’s shoes, so finding a way to be Roscoe that I felt I could relax into was very important. I think it finally clicked into place when I found a deeper voice that would carry without me having to force it. Because you leave feeling happy. It’s hilarious and silly and very clever, and I still laugh every night back stage in the scenes I’m off. It’s a perfect antidote to this chilly springtime. How does it feel to be making your West End debut? Overwhelming, I still feel dazzled at the end of the show. I hope I don’t get found out! Be nice to your mums. Many thanks Amy for taking time out to answer a few questions and best wishes for One Man, Two Guvnors!